One of the great tragedies of Ottoman rule from the perspective of the Greeks, successors of the fallen Eastern Roman Empire, are the stories of the mothers of some of the Ottoman Sultans. A tragedy because they were usually taken by force from their Greek families and made to convert from Orthodox Christianity to Islam and marry a powerful Sultan or Prince. It seems that most if not all these women came to embrace their fate, and for Turks no doubt their stories are anything but a tragedy. Below are some of their profiles. Nilüfer Hatun, Greek birth name Holophira, the daughter of a Greek noble from northeast Anatolia, was mother to the Sultan Murad I Hudavendigar (r. 1362–1389). Osman, founder of the Ottomans, raided Bilecik at the time of Holophira's wedding. Arriving there with rich presents and disguised and hidden soldiers, Holophira was among the loot and given to his son Orhan as a bride and made a Muslim. She was the first queen mother to bear the prestigious title Hatun (the feminine of khan, han in Turkish). Notably, her son’s nickname Hudavendingar is identical to the name of the Anatolian region around Bursa whence she came from, which was in Ottoman times sometimes called the Hudavendingar. Gülçiçek Hatun, Greek birth name Maria, was the Greek wife of a prince in an Anatolian beylik (principality) around Balıkesir. 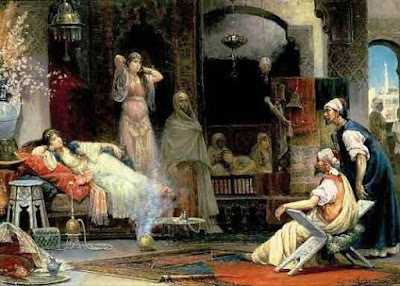 Several years after the death of her husband when the Ottoman Orhan conquered the region in 1344, she was captured and placed in the palace harem and made to convert to Islam. Some years later, when Orhan's son Murad had reached adulthood, an attempt was made to marry Gülçiçek, but she refused several names suggested to her, until Murad suggested himself. She married Murad I in 1359 and bore him the future Sultan Bayezid Yildirim (r. 1389-1403), whose reign is overshadowed in fame by the story of his captivity to Tamerlane, which has spawned countless artistic reproductions and theatrical plays. Kösem Sultan, Greek birth name Anastasia, the daughter of a Greek Orthodox priest from Tinos. She was bought as a slave by the Bosnian governor, and sent, at the age of fifteen, to the harem of Sultan Ahmed I. Upon her conversion to Islam, her name was changed to Mahpeyker, and later by Sultan Ahmed I to Kösem. She was a much later Greek valide sultan, and a de facto ruler of the Ottoman empire - during the informal gynocracy known as the “sultanate of women” in the 16th and 17th centuries. She was mother to two Sultans, Murad IV (1623–1640) and Deli Ibrahim (r. 1640–1648). Apart from being the dominant figure even during her sons’ reigns, she was also formal regent for 1623–32 and again 1648–52. 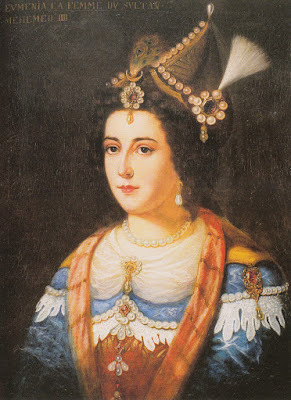 Rabia Gülnuş Sultan was born in 1642 and from the town of Rethymno in Crete, when the island was under Venetian rule; she was originally named Evmania Voria and she was an ethnic Greek, the daughter of a Greek Orthodox priest. She was captured by the Ottomans during the invasion of Crete in 1645 and made a slave in Constantinople. She was renamed Mahpare and was given a thoroughly Turkish and Muslim education in the harem department of Topkapi Palace and soon attracted the attention of the Sultan, Mehmed IV. They had two sons both of whom became the future Sultans, Mustafa II (r. 1695–1703) and Ahmed III (r. 1673–1736). 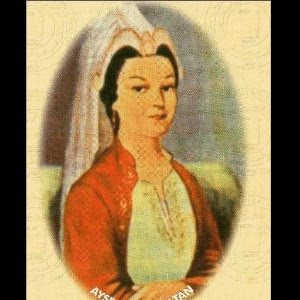 Having died in 1715, she was the last imperial concubine to be legally married to an Ottoman Sultan. The above are merely a sample - there are other sultans who may have been Greek on their mothers’ side, such as Ahmed I (r. 1603–17) or Mahmud I (r. 1730–54), from Hamdan Sultan and Saliha Sultan, respectively. There were several others of more generally European and Christian origin - apart of course from Turkish mothers, there were Albanians, Ukrainians, Bosniaks, Serbs, and even Poles. However, the most common was the Circassians and Georgians, from what is the Eurasian region of the Caucasus.